Finished tacos, poorly lit, shortly before rapid consumption. Sometimes the vague idea of dinner presents itself, without a clear inclination of what it wants to be when it grows up. I like those times, because it usually ends up like an episode of Chopped. Tonight, I wanted something sort of Mexican, but not spicy Tex-Mex. Strict adherence to cultural accuracy not required. The basket: An avocado. An heirloom tomato. A large package of corn tortillas. A pound of ground beef. The baked tortilla chips were dusted with kosher salt and a tiny sprinkling of garlic powder and pepper. 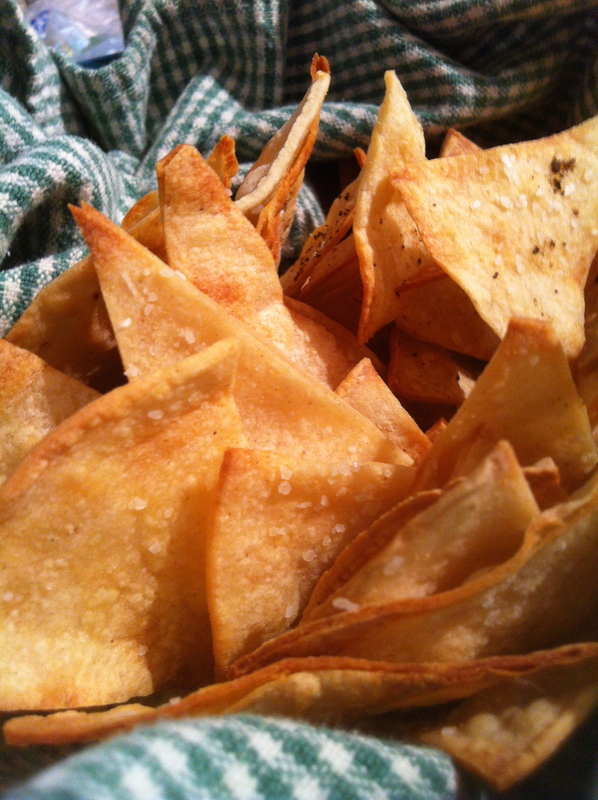 Baked tortilla chips from the Cooking Matters workbook. When I have taught this class in the evenings, we started one of the sessions with these chips and a bean dip that was also listed in the workbook. Tonight, I had intended to make guacamole but only had the one avocado. Kept simple, that little green orb could reach higher levels of greatness in the main course. For the chips, store-bought salsa it was. Want to make some of these chips? No recipe to it, really. Just cut some tortillas (corn or flour if not GF) into triangles. Spray a baking sheet with cooking spray and place the triangles on the tray. Spray the tops of the triangles and sprinkle with salt — not too much! — and any other seasonings you might like to use. Bake at 425 degrees for 8-10 minutes or until just turning brown here and there. Let sit for a few minutes before eating to let them crisp up. I couldn’t really figure out what to call this, so I just added ingredient names together until it sounded as delicious as it was. 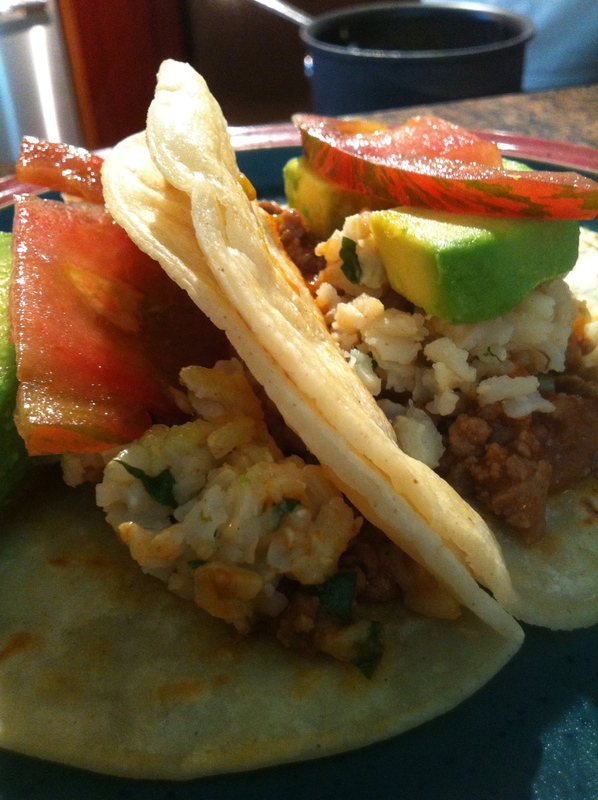 How about Tacos with Heirloom Tomato Beef, Coriander Rice and Avocado? Sure, sounds good. And be sure to capitalize all the words; that makes it even better. In a medium pot, combine all ingredients for the rice except the fresh cilantro or parsley. Bring to a boil then cover and reduce the heat to the lowest setting. Brown rice takes about an hour to cook, so start this first. When the rice is done (probably after you’ve completed the other steps), fluff with a fork and fold in the fresh herb. Cover and keep warm. Over high heat in a heavy-bottom skilled or pot (I used a Dutch oven), brown the ground beef. Add the garlic when the beef is almost done. When the beef is cooked through and the garlic is fragrant, drain fat and return to medium heat. Add the tomato sauce and cook until slightly darkened. Stir in the diced heirloom tomatoes and cook for about 3 minutes. Stir in the cumin, chili powder and salt. Place the cornstarch in a small bowl or mug and add a couple tablespoons of cold water. Add an ice cube if it’s not very cold. Stir a bit until dissolved, remove the ice cube and pour the slurry into the beef mixture. Stir over heat until thickened. Cover and keep warm. Using a sharp knife, cut the avocado lengthwise in half, cutting around the large seed in the middle. Using a butter knife, cut slices completely through each half with the skin still intact. With a large spoon, lift the slices out into a bowl. Repeat with the other half. Squeeze the juice of half the lime onto the slices and toss. In a heavy cast iron skillet or griddle, heat a very small amount of lard until melted and hot, or spray with cooking spray. Heat corn tortillas (one at a time in the skillet; more if using a griddle and its size allows) until small brown spots appear. Flip and cook on the other side. When the tortillas are ready, you can assemble the tacos. Spoon a bit of the meat mixture and then the rice into each taco. Top with an avocado slice and a slice of tomato. Squeeze a bit of lime juice on top or serve with lime wedges. If you like, garnish with more cilantro or parsley.